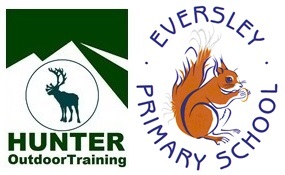 The basis of the Project is to enable all pupils at Eversley Primary School, in Pitsea, Essex, to add to their learning in the classroom by introducing and developing themes and topics outdoors. The outdoor work - very much a 'laboratory for learning in new ways' - supports their understanding, by getting 'hands-on', real, practical experience of seeing and doing, whether that be by experimenting in science based topics, using the whole school site and especially the natural world that is what we call 'Eversley Heights' - the recreation ground and surrounding areas - to develop, for example, map skills, or by searching and researching in the natural world. We are outside and often off-site for much or all of every outdoor education session. Looking south-east from the highest point of Eversley's recreation ground - a place we call 'Eversley Heights' . NB. Most aspects of this course are the intellectual property of B.J.Howard & Hunter Outdoor Training. Be aware that outdoor education and training necessarily means the use of potentially dangerous equipment if misused, and involves being outside in all weathers albeit under the leadership of those with expertise to guide and instruct. The material, methods, philosophy, and skills, taught and delivered over the course of a school project have been exhaustively trialled and used over decades but takes no account of the potential behaviour of pupils on a day-to-day basis. No pupils work in total isolation at any time, on any course, but on a number of occasions adults are not working 'shoulder to shoulder' with them, thus giving the youth the opportunity to prove their learnt/innate ability to work at ever increasing levels of independence, which we believe is part of the process of maturing into 'fully-orbed' young people.